Forecasting and prevention of risks, rescue of affected populations, contrast and overcoming of the emergency and mitigation of risk are the civil protection activities identified by law n. 225/92, establishing the National Service. The main objectives of these activities - which the Department directs, promotes and coordinates in cooperation with regional governments and local authorities - are the protection of people and the protection of the territory in case of earthquakes, floods, landslides, volcanic eruptions or fires. The forecasting activity - carried out with the help of competent scientific and technical subjects - aims to assess risk scenarios and, when possible, to pre-announce, monitor, monitor and monitor the expected events and risk levels. According to the legislative decree 81 of 2008, among the protective devices of the civil protection can not miss the helmet because, whether it is dealing with an earthquake, a flood or a landslide, there is always the risk that the failure created can lead to the fall from heavy objects. 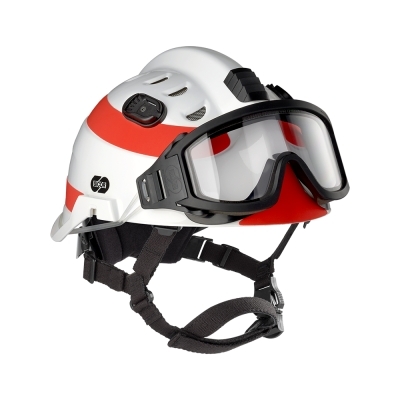 This is why Sicor has introduced a functional and ergonomic helmet, with special stiffening ribs.